A warm amber color. Spicy, floral hops mingle with toasty malt on the nose. On the palate, that balance centimes with sweet carmel at the base and performed hops hovering just over the tongue, uniting a smooth, dry crisp whole. The beer smells like a lager. Makes sense… this beer is a lager. It has a weak carbonation on top, and sits like a pale in the glass. This beer does get better the warmer it gets. But the beer is an easy find, cheap, and not one that you want to sit around and get warm. At least close to room temperature. You get a hint of that carbonation on the palate, just as the flavor leaves. It’s quick, slides down easy, and is a drinkable beer. Its a lager… nothing fancy about it. I’m very tired, so forgive me if this review isn’t entirely coherent. 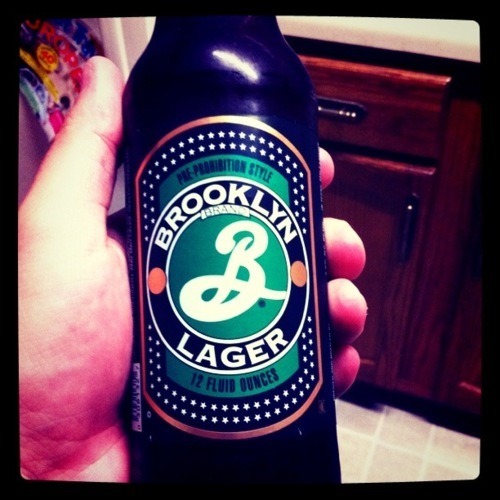 It looks like we are trying a beer from Brooklyn Brewery tonight. Oh, and it’s been a while! Ricky has been gone the last few days, so we haven’t been able to try a new beer together. But tonight, we’re back! I’m not sure why (maybe I’m quite off here) but when I think of a lager, I tend to think of a darker beer. This one is almost in-between the color of a wheat and a brown, kind of orange in color. It smells very wet, almost a musty smell to it. It has just a hint of the smell of bread to it. Not much head when poured out, just a nice pour from a 12-ounce bottle. It has a very strange flavor. Or maybe I just haven’t had that many lagers? (Is it weird that I picture like, Paul Bunyan, when hearing that word? You know, “logger”? I’m a dork, I know…) It tastes somewhat carbonated, and almost has a watered-down taste to it, in my opinion. I don’t really tend to like my beer watered-down, really. It definitely leaves an aftertaste, but it’s not one that I can readily identify. I guess it’s just not a taste I’m a fan of. I’m not sure how a beer can taste flat and carbonated at the same time, but to me, this beer manages to do just that. Not a big fan, and not one I’d probably purchase again.